The Richmond Heights Police Department responded to 79 traffic accidents in the month of December, 2016. This is down from the 85 accidents that were handled in December, 2015. 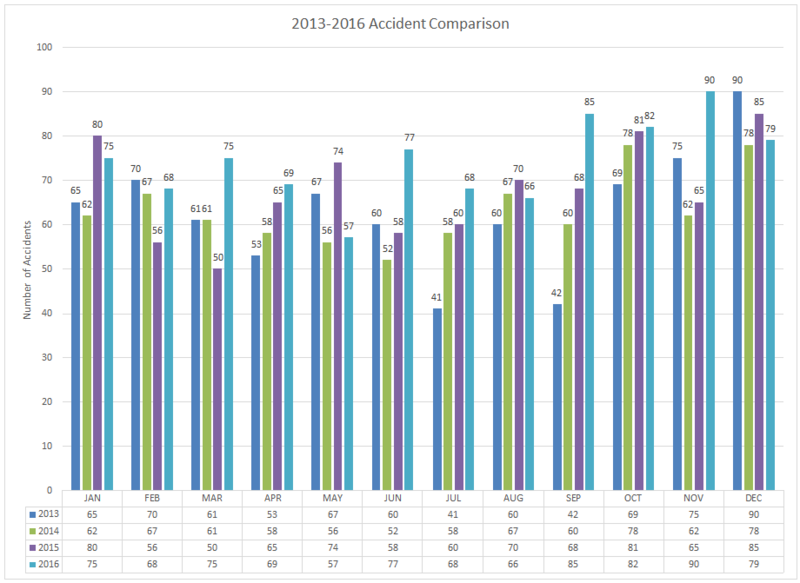 In 2016 we responded to 889 accidents. This is 77 more than in 2015. The Richmond Heights Police Department responded to 90 traffic accidents in the month of November, 2016. This is up from the 65 accidents that were handled in November, 2015. For the year, we have responded to 810 accidents. This is 83 more than the same time period in 2015. 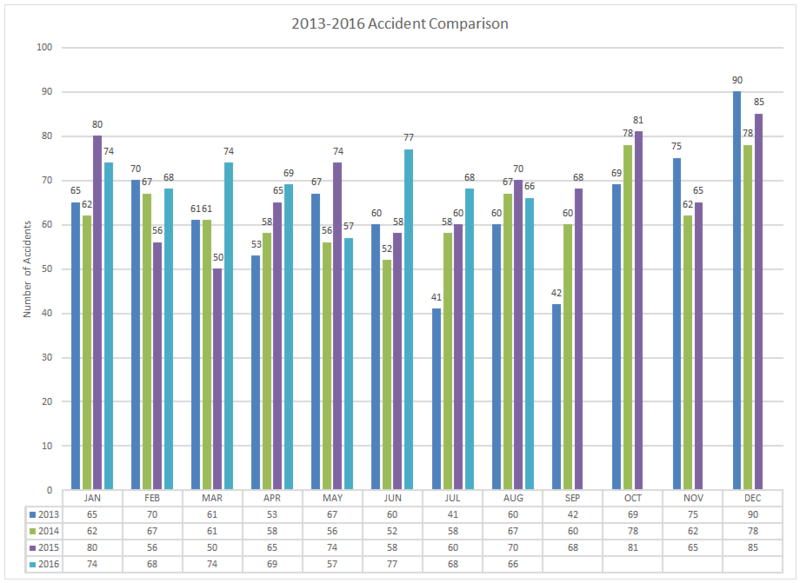 The Richmond Heights Police Department responded to 82 traffic accidents in the month of October, 2016. This is up from the 81 accidents that were handled in October, 2015. For the year, we have responded to 720 accidents. This is 58 more than the same time period in 2015. The Richmond Heights Police Department responded to 85 traffic accidents in the month of September, 2016. This is up from the 68 accidents that were handled in September, 2015. For the year, we have responded to 638 accidents. This is 57 more than the same time period in 2015. The Richmond Heights Police Department responded to 66 traffic accidents in the month of August, 2016. This is down from the 70 accidents that were handled in August, 2015. For the year, we have responded to 553 accidents. This is 40 more than the same time period in 2015. The Richmond Heights Police Department responded to 68 traffic accidents in the month of July, 2016. This is up from the 60 accidents that were handled in July, 2015. 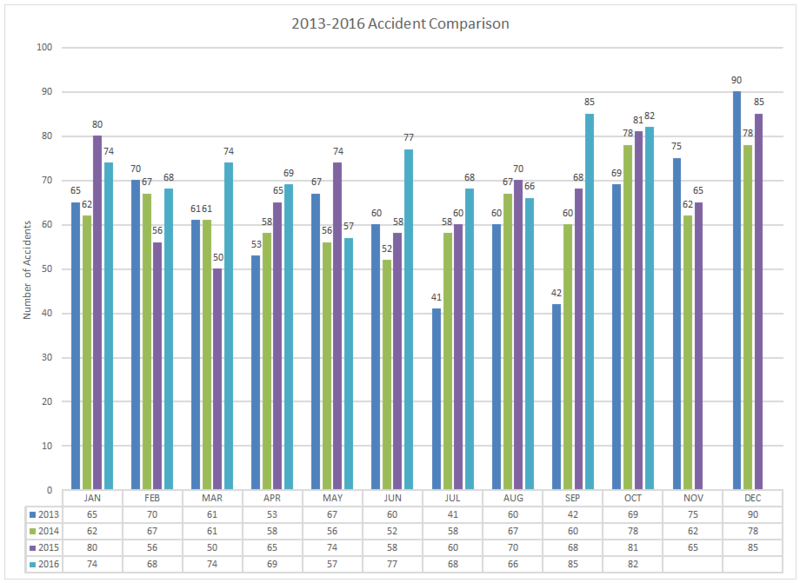 For the year, we have responded to 487 accidents. This is 44 more than the same time period in 2015. The Richmond Heights Police Department responded to 77 traffic accidents in the month of June, 2016. This is up from the 58 accidents that were handled in June, 2015. For the year, we have responded to 419 accidents. This is 36 more than the same time period in 2015. 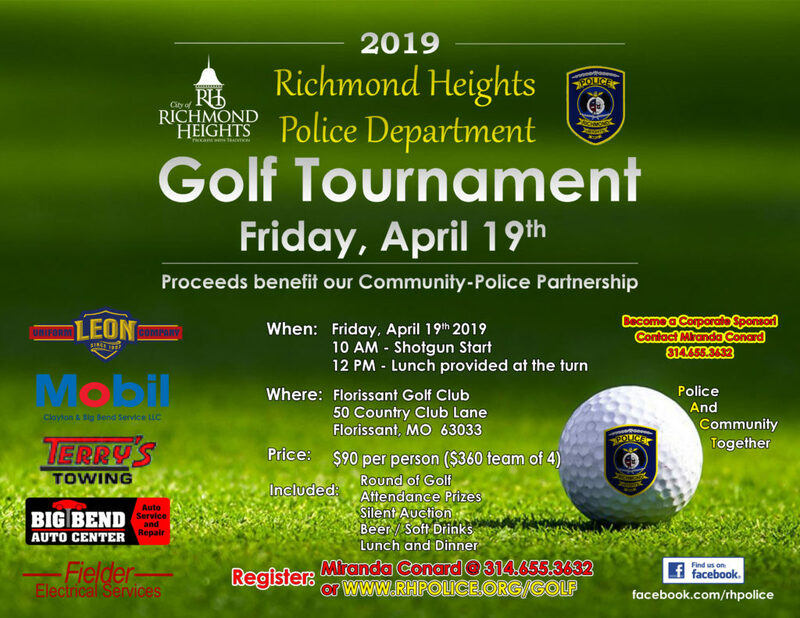 The Richmond Heights Police Department responded to 57 traffic accidents in the month of May, 2016. This is down from the 74 accidents that were handled in May, 2015. For the year, we have responded to 342 accidents. This is 17 more than the same time period in 2015.